Recently a British court ordered researchers to withdraw a paper, “Dismantling Megamos Security: Wirelessly Lockpicking a Vehicle Immobiliser” from next week’s USENIX Security Symposium. This is a blow not only to academic freedom but also to progress in vehicle security. And for those of us who have worked in security for a long time, it raises bad memories of past attempts to silence researchers, which have touched many of us over the years. Are There Countries Whose Situations Worsened with the Arrival of the Internet? Are there countries whose situations worsened with the arrival of the internet? I’ve been arguing that there are lots of examples of countries where technology diffusion has helped democratic institutions deepen. And there are several examples of countries where technology diffusion has been part of the story of rapid democratic transition. But there are no good examples of countries where technology diffusion has been high, and the dictators got nastier as a result. Over twitter, Eric Schmidt, Google CEO, recently opined the same thing. Evgeny Morozov, professional naysayer, asked for a graph. So here is a graph and a list. 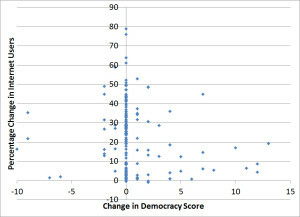 I used PolityIV’s democratization scores from 2002 and 2011. I used the World Bank/ITU data on internet users. I merged the data and made a basic graph. On the vertical axis is the change in percent of a country’s population online over the last decade. 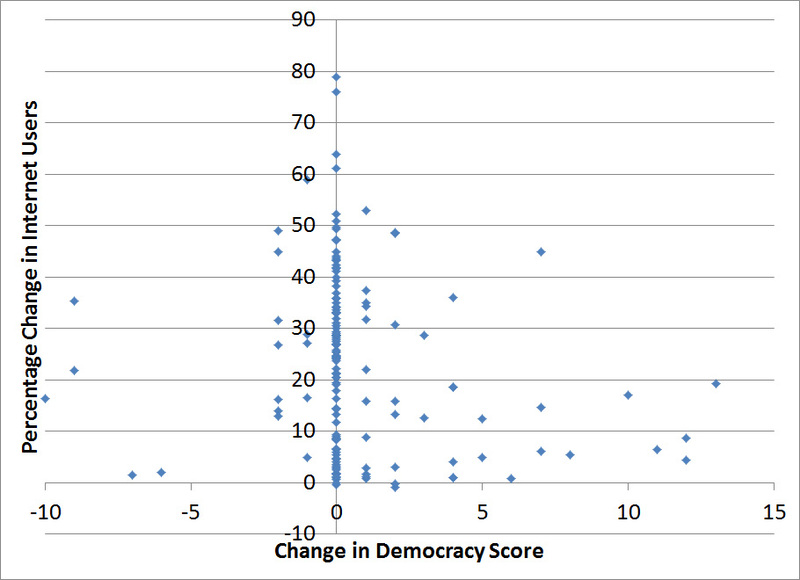 The horizontal axis reflects any change in the democratization score–any slide towards authoritarianism is represented by a negative number. For Morozov to be right, the top left corner of this graph needs to have some cases in it. Look at the raw data.